Howard Leight by Honeywell Quiet Reusable Foam Ear Plugs provide good protection and comfort from a reusable earplug, for consistent attenuation during all-day wear. Quiet requires no rolling - its built-in flexible stem adds in ease of insertion and immediate comfort. Its smooth, non-irritating skin provides all-day comfort and is easy to clean up with soap/water for extended wear. For Motorcyclists: Quiet has no external stem to interfere with helmet wear, and the NRR 26 is ideal for most riding situations. Just enough attenuation to reduce wind noise to a manageable level, but not so much that you cannot hear traffic when you need to. Available in three sizes, corded or uncorded, and with or without a sturdy carry case. Average size is also available in a nice beige natural color instead of the standard orange color. Howard Leight by Honeywell Quiet Reusable Foam Ear Plugs (NRR 26)5WendySeptember 14, 2017I purchased about 6 different ear plugs a year ago and have tried all. This NRR 26 is the most easy to use. The small is perfect fit...in my left ear. The med fits perfect in my right. Easy to insert correctly. The ones that you have to roll and quickly insert never expand correct for me. I don't know how sizing works so I purchased a medium and a small. I'm 5'1" and petite. The small is perfect...for my left ear. The medium is perfect for my right. So I mix and match and life is good. We are on motorcycles. Howard Leight by Honeywell Quiet Reusable Foam Ear Plugs (NRR 26)5JaneFebruary 10, 2016I need complete quiet to sleep and these do the trick. They fit well and are easy to put in. I have bought the corded ones for the convenience of keeping them together. Howard Leight by Honeywell Quiet Reusable Foam Ear Plugs (NRR 26)5Timothy SchmidtAugust 10, 2015I have trouble sleeping with noises around me and was never really satisfied with other ear plugs. The silicone gel ones get furry after a night and the foam ones just don't seem to block the noises that bother me as well. When I tried these they were a life saver! I actually scoured the web for them after my local store stopped stocking them. Howard Leight by Honeywell Quiet Reusable Foam Ear Plugs (NRR 26)5JimJune 2, 2015Don't work for me. They probably would be OK for cylindrical ear canal. Howard Leight by Honeywell Quiet Reusable Foam Ear Plugs (NRR 26)5mary laingJuly 29, 2014I bought 2 other times. each time very happy with purchase. I like that these do not hurt my ears unlike foam ones. Howard Leight by Honeywell Quiet Reusable Foam Ear Plugs (NRR 26)5Dan SyllabaJuly 8, 2014First time using this type of earplug. Am avid motorcyclist and wife uses for noise while vacationing (Costa Rican monkeys!). Fulfills both needs very well - good product and easy to use. Howard Leight by Honeywell Quiet Reusable Foam Ear Plugs (NRR 26)5DaveMay 21, 2014These work for side sleepers if you pull out the pin in the middle. I'm a side sleeper, too. Howard Leight by Honeywell Quiet Reusable Foam Ear Plugs (NRR 26)5DaveMay 21, 2014These are better than the foam ones that I used to use! Howard Leight by Honeywell Quiet Reusable Foam Ear Plugs (NRR 26)4LizMay 11, 2014These actually fit my tiny ear canals, however, it takes some effort to push them into my ears. They would be perfect if a tiny bit smaller and if the outer portion didn't stick out so much - not comfortable for side sleepers. Howard Leight by Honeywell Quiet Reusable Foam Ear Plugs (NRR 26)5RikiSeptember 17, 2013These are the best ever. Been using them for many years. I certainly don't get the review that says they don't work for side sleeping. These are the only ones I've found that do work for side sleeping because they don't put pressure on the downside ear. The only way I can imagine it hurting is if they don't take out the center foam bar once it's inserted. Oh well! Love these. Can't do without them. Howard Leight by Honeywell Quiet Reusable Foam Ear Plugs (NRR 26)4VirginiaAugust 16, 2013I like these plugs because I can use the stem to get them far enough into the ear canal to be of use. I didn't find them all that comfortable for sleeping. I sleep on my side and the down side plug kept me awake. I will definitely use them for waking activities. Howard Leight by Honeywell Quiet Reusable Foam Ear Plugs (NRR 26)5SusieJuly 25, 2013The only ear plugs I have found that fit in my small ears. I wear these to block out my husband's snoring and they work great! They stay in my ears all night and are very comfortable. Howard Leight by Honeywell Quiet Reusable Foam Ear Plugs (NRR 26)1AugieMay 4, 2013I bought all 3 sizes. I couldn't get any of them to fit properly in my ear. Of no use to me. Maybe others will have better luck. Howard Leight by Honeywell Quiet Reusable Foam Ear Plugs (NRR 26)5tlemoineDecember 18, 2012I tried a variety of the foam earplugs/brands, but these work fantastic! Eliminates the bulk of annoying wind noise, which makes riding more enjoyable, especially in day to day traffic. Be sure to get the right size. Try all three sizes. Worth it. A pair will last me roughly 6 months+ used almost daily. They start to smooth out (but still work), but I just like to change them out then just to do it. Ordering more! Howard Leight by Honeywell Quiet Reusable Foam Ear Plugs (NRR 26)5Gary SheriffAugust 22, 2012Great - they really work. Howard Leight by Honeywell Quiet Reusable Foam Ear Plugs (NRR 26)5sharonJuly 16, 2012these work great for me. I have just started wearing a half helmet after 25 years of a 3/4 one and needed some ear protection. This was the answer. Really block the wind and noise. Only negative thing I could say is the bright orange, a neutral color would be better. Howard Leight by Honeywell Quiet Reusable Foam Ear Plugs (NRR 26)5Jeff DillJuly 16, 2012Quality seems good. Bought them for motorcycling. Unable to use due to ear plug being removed by center stem protruding from ear plug while putting helmet on. Howard Leight by Honeywell Quiet Reusable Foam Ear Plugs (NRR 26)5RobertMay 8, 2012I have ordered these before and they always work great. Very, very quiet. Howard Leight by Honeywell Quiet Reusable Foam Ear Plugs (NRR 26)5JohnMay 3, 2012My brother gave me a set a while ago and they worked great. Glad to see that I could get more. This is the only plugs that I wear now. Howard Leight by Honeywell Quiet Reusable Foam Ear Plugs (NRR 26)5JacquelineFebruary 7, 2012These are the only ear plugs I use. I have lived on a busy road for 15 years and have tried everything. They are the only earplugs I find effective and comfortable enough to sleep in. The only complaint I have is the exorbitant $46 shipping to Australia. But it's still worth it! I've been ordering from the company for many years and they have always been professional and reliable. Ps. Standard size is perfect for my pretty average sized ears. Howard Leight by Honeywell Quiet Reusable Foam Ear Plugs (NRR 26)5KayJuly 23, 2011I love that the ear plugs don't have to be rolled prior to inserting in the ear....this allows for quick insertion. I do wish they came in a variety of colors. The wind noise, while riding motorcycles, is decreased and the ear aches eliminated. Great addition to riding gear. Howard Leight by Honeywell Quiet Reusable Foam Ear Plugs (NRR 26)5BrunoJune 5, 2011Just got my order of 25 pairs. Very nice fit (went for the large size even though my ears aren't). 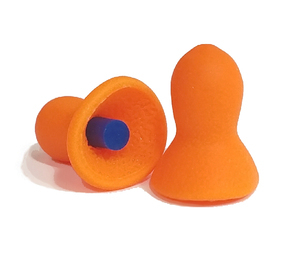 Because of the semi rigid stem, these earplugs are extremely easy to handle (not too spongy like some). Tried them for sleeping and they didn't fall off (like the Zonk Out). Tried them on during a wicked industrial dubstep concert (Modeselektor, awesome) and they did just fine protected my ears against the vicious bass onslaught. I only wish they came in cool colours for a change. Other than that, my search for the perfect earplug is over. Howard Leight by Honeywell Quiet Reusable Foam Ear Plugs (NRR 26)5SteveMarch 25, 2011Best reusable foam ear plugs I have ever used. I use them when running chainsaw, at shooting range and particularly when riding motorcycle. Headphone type ear protection is clumsy when working and your ears get sore from the pressure on you external ears, and they are soo hot in the heat. I ride a loud bike, and these earplugs ease the wind noise and the bike noise fatigue when riding helmet free for long periods. Howard Leight by Honeywell Quiet Reusable Foam Ear Plugs (NRR 26)3AlexFebruary 13, 2011Very comfortable. They seem to be able to offer good protection but the "standard" size is too small for my ears. I am going to try the "large" size. Howard Leight by Honeywell Quiet Reusable Foam Ear Plugs (NRR 26)5Mary Stuart SharpDecember 17, 2010I would have preferred a more neutral color but, other than that, the ear plugs fit extremely well and block out most of the unwanted noise from loudspeakers and amplifiers that I want to avoid. I am very pleased with the product.